This club feels great. I hate the fact that I even like a club called a "rescue club," because it is obviously very telling of my game and how much I need to be... uh... rescued. Not only does this pick the ball up quickly and get you out of some ugly lies (I tried the 17 degree loft), but it also has a great "dual crown" design that gives a very even clubhead weight and simply "feels" good to swing. The stiff flex graphite shaft lets you swing enough to get good clubhead speed -- and it even boasts "SuperFast Technology" to boot. The shots that I was able to hit off grass came out fairly clean (ahem, ok -- a few shots were fat; leave me alone...) and were very forgiving. Even one of them actually went where I was really aiming for. This club, while not too expensive, is much more effective than the Nike Slingshot Hybrid, and even better than some of the other Adams Tight Lies that were popular several years ago. I found myself updating my Father's Day list after hitting this one. 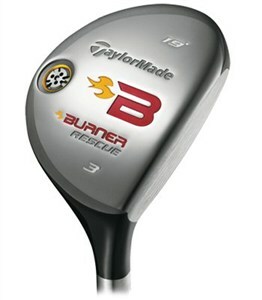 Now I just need another club that doesn't get me into a position where my new TaylorMade will have to "rescue me..."